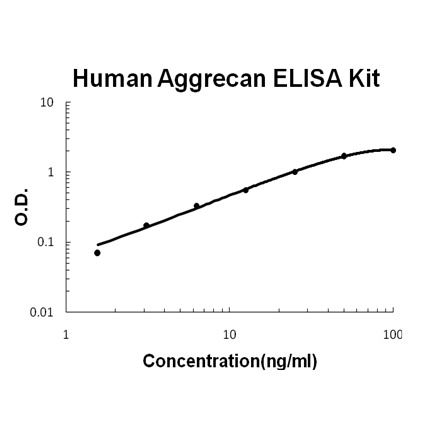 Intended UseHuman ACAN ELISA Kit allows for the in vitro quantitative determination of ACAN , concentrations in serum, Plasma , tissue homogenates and Cell culture supernates and Other biological fluids. specificalPrinciple of the assay: Human Aggrecan ELISA Kit was based on standard sandwich enzyme-linked immune-sorbent assay technology. A monoclonal antibody from mouse specific for Aggrecan has been precoated onto 96-well plates. Standards (NSO, V20-G675) and test samples are added to the wells, a biotinylated detection polyclonal antibody from goat specific for Aggrecan is added subsequently and then followed by washing with PBS or TBS buffer. Avidin-Biotin-Peroxidase Complex was added and unbound conjugates were washed away with PBS or TBS buffer. HRP substrate TMB was used to visualize HRP enzymatic reaction. TMB was catalyzed by HRP to produce a blue color product that changed into yellow after adding acidic stop solution. The density of yellow is proportional to the human Aggrecan amount of sample captured in plate. Background: Aggrecan, also known as cartilage-specific proteoglycan core protein (CSPCP) or chondroitin sulfate proteoglycan 1, is a protein that in humans is encoded by the ACAN gene. It is a critical component for cartilage structure and the function of joints. Aggrecan provides intervertebral disc and cartilage with the ability to resist compressive loads. The localized high concentrations of aggrecan provide the osmotic properties necessary for normal tissue function with the GAGs producing the swelling pressure that counters compressive loads on the tissue. This functional ability is dependent on a high GAG/aggrecan concentration being present in the tissue extracellular matrix. Also, Aggrecan plays an important role in the organization of the extracellular spaces between neurons in the brain. Inquiry About Human ACAN ELISA Kit If you hope to order it or contact us directly, please contact us via sales@biobool.com. We will get back to you in 12hrs,Thanks!